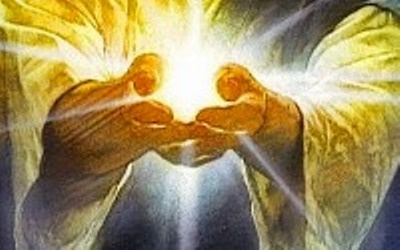 SANANDA'S MEDITATION - "HEALING HANDS OF LOVELIGHT"
Ashtar's Message: "Get up in the LoveLight and CONNECT WITH YOUR HIGHER DIMENSIONAL SELF, because that's where you get the Higher Dimensional Perspective! That's where you get the power - the empowerment, the strength - to get up and out of the dumpies! Now Sananda can connect you in His LoveLight sessions..."
Sananda's Invitation to You: "Greetings, Beloved Ones! Because there are so many energies and changes occurring rapidly in your World - and indeed within your own Beings - I invite you to come to me for the learning of a most Healing Meditation. For it is that you may be experiencing more challenges and stresses than ever. And it is most necessary that you persevere with freeing yourselves from your remaining 3D core issues, as you proceed with your Ascension preparations! I am with you in service and in Love, and I welcome you into a loving and empowering Meditation with Me! Namaste!" Download the mp3 to experience and begin to learn Sananda's "Healing Hands of LoveLight Meditation." Relax into the bliss of His Love and feel the High Energies! Then you can practice the Meditation and re-experience these Energies by continuing to listen to it. Within two weeks after you order the mp3, we will email you "The Path," which Sananda has given to assist your learning. This is a document which gives written directions to guide you. LoveLight is the most powerful energy in the Universe! It is the very Life Force from which we are all made, and this Meditation is a means for you to access more of it, to literally expand yourself with it completely, throughout all of your energy fields. Further, as Sananda guides you through it, he will connect you with your Higher Dimensional Self, Mother Gaia and all of her Kingdoms, our Creator, and with all beings of LoveLight in the Universe! This is not just another healing tool, but it can be used by all - including healing practitioners, in order to further energize their work. It carries only the very Highest frequencies of Love and Love's creations! The Meditation is comprehensive. When you first experience it, it will take 53 minutes for Sananda to take you along its Path. However, with practice, you can bring in the LoveLight very quickly to empower whatever High vibe clearings, healings and resolutions you are choosing to create - there are no limits!